I spent most of this weekend trying to come up with something witty and funny to do for April Fools day, but… honestly… I got nothing. Therefore, we’re just going to keep puttering along here in paper doll land. Sorry guys, I’m just not that good at that sort of thing. I hope everyone had a wonderful Easter or is still having a wonderful Passover, depending. I had a quiet day spent working on blog stuff and cleaning my apartment. I rather enjoyed myself, I confess. I’m also not totally pleased with his face. I don’t think he looks as African-American as I had planned him to look, but I am trying my best. I think he’s okay, but I’m not totally pleased. The most commonly requested thing for the blog, outside of sometimes asking for more things in black and white, is for a boy for Marisole Monday. I know this has taken a long time to happen and I don’t regret that. I drew about seven versions of this pose before I finally had one that I felt didn’t look like he was HUGE next to Marisole and her friends or looked like he was creepily androgynous (not in metro-sexual way, but rather in a… disturbing alien sort of genderless way). So, today we have the first of the males of Marisol Monday. Since the girls are Marisole, Mia and Margot, it seems only fitting to give the first of the boys an M name as well. After some thought, I have settled on Marcus. Though I have been often asked for a boyfriend for Marisole, I am not defining Marcus’ role. He could be a friend, a brother, or a lover. There’s no reason to be hetronormative with Marisole Monday. I should also add that since the Marisole Monday family is growing, I’ve renamed the sets “Marisole Monday & Friends” and will probably be redesigning their logo in the future. I am going to confess right now that I don’t know how many Marcus’ dolls I will do. I have two other sets in the works, but as I have mentioned before, I find men’s clothing really dull for the last two hundred years or so. I work on a college campus and so I get a fairly good look at what young men wear these days and well… I just can’t imagine drawing hoodies and jeans for the rest of my life. I’m not say there won’t be other boys in the Marisole Monday world, but they probably won’t be too common. Okay, so news: After some deliberation I settled on Natalie’s suggestion for a name “Mini Maidens”, though I have to mention that DotRot’s suggestion of “Faye and the Holidaze” was probably the one that made me laugh the hardest. I have a soft spot in my heart for alliteration. I want to thank everyone for entering, since I hate naming things. Anyway, I hope everyone likes the Mini Maidens and their new place among the serial dolls on the site. They aren’t on the Index page yet. With one thing and another last night, I forgot to make them an icon, but they’ll be added soon. Some of you probably remember my Chinese New Year and Valentine’s Day Paper Dolls which I did last month. After I did them, I found myself drawing a lot more for this pose. So, I decided to actually name the first of the dolls. I have named her Faye, after a Chinese foreign exchange student I knew in graduate school. Her wardrobe, like that of my grad school friend, is girly and a hint of boho. I haven’t updated the Printable Paper Doll Index with her yet, but I will be soon. Probably this weekend. By the way, the new series needs a name. So, I am asking for recommendations for a good name for these little paper dolls. I’ll select my favorite from the comments in a week (Friday the 22nd) and the winner will get a custom paper doll set of their choice. 1. You can enter up to three names. 2. You can only win one contest a year. 4. 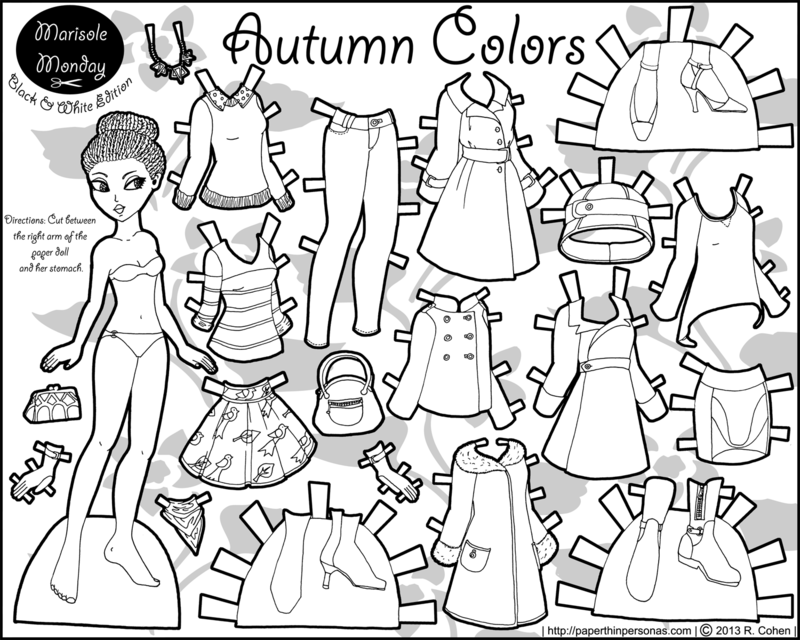 The winner will receive a one page custom paper doll based on one of my paper doll series within a month of the end of the contest. Sometimes life gets in the way of this goal, but I will email the winner if that is the case and we can make other arrangements. 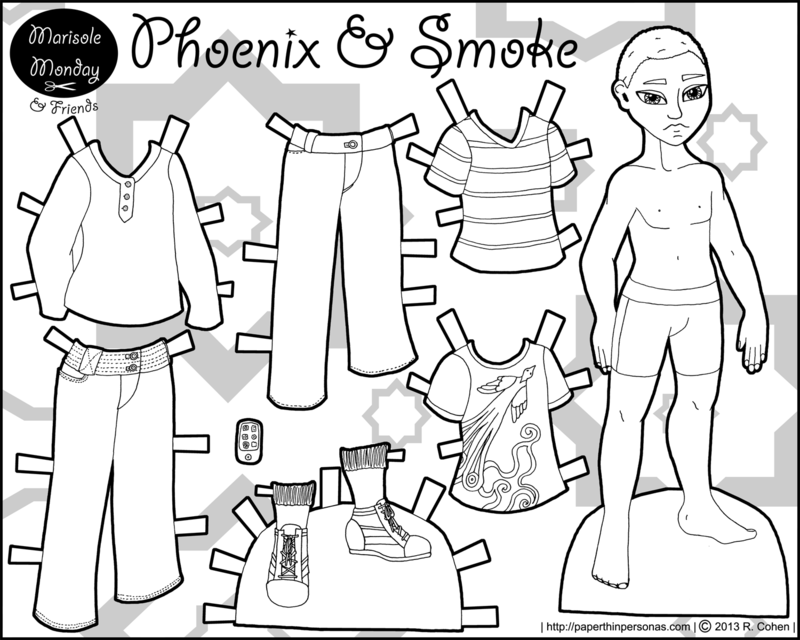 So, enter your paper doll series names and we’ll see what we’re going to call this new set of paper dolls. I have a similiar relationship with blond hair and brown skin as I do with red hair and brown skin. This is to say that I try it and than I don’t like it and swear I won’t do it again and than I do it again. Unlike the red-hair brown skin combination which I never feel like I’ve achieved, this blond hair brown-skinned Marisole is look pretty cute to me. I think it’s her braids. Have I mentioned that I am totally in love with her braids? So, February has come and gone. 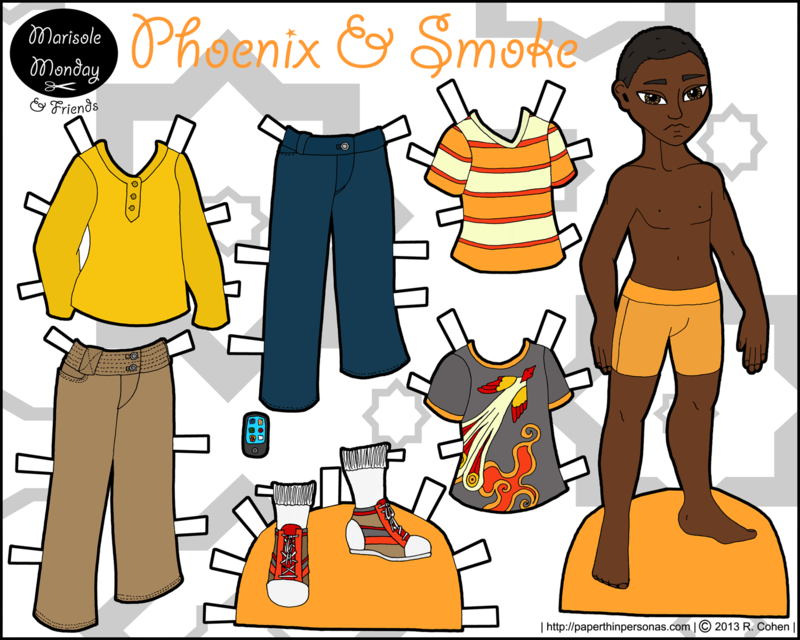 Last year I noted African American History Month (which is February) by compiling a list of paper dolls around the web. And um… I kinda forgot this year.So, though I don’t have another list of paper dolls, I would like to draw attention to Paper Doll’s by Gail where there are lots of lovely African American paper dolls including Condoleeza Rice, Michelle Obama, Halle Berry and Fantasia Barrino. Also, though unrelated to African American paper dolls, the entire cast of Twlight. So, this was supposed to go up last Monday, but clearly that didn’t happen. Never the less, here she is on this Monday looking as dashing as ever. Sunday was Purim, as some people probably know. Purim is one of my favorite holidays, mostly because of fond memories from when I was a child an the joy of making and eating hamentashen. As usual, I made far more of them than I could eat and so I’ll be giving them to various people today. 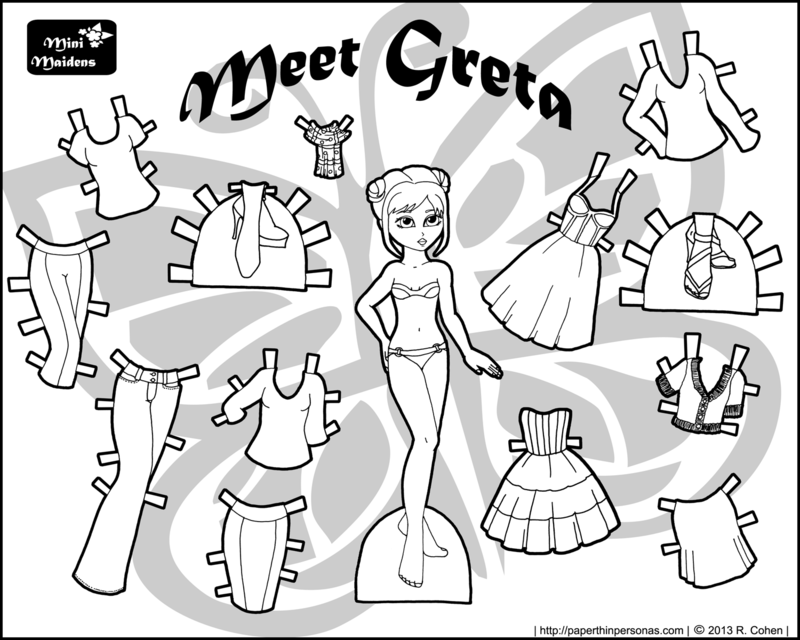 Several years ago, I drew an Esther paper doll, though you’ll have to scroll down a little to see her in the post. Anyway, in other news, I know I’ve neglected the blog over the last few weeks. I’ve been really busy, but I’m hoping to get back onto the ball with it. A few things are going to be changing, so keep your eyes open for a new about section and a few other new things- nothing radical, mostly housekeeping chores that I put off for a long time and finally am getting around to. Today’s paper doll was inspired by a lot of different things, but mostly by my realization that I haven’t drawn very many coats for my paper dolls (with the exception of my Snow Day set, years ago) and my new found favorite research tool- hair style magazines, particularly black hair style magazines which I can draw hairstyles out of. I do feel a little self-conscious buying the magazines at the local drug store, since the woman behind the counter usually gives me an odd look, but they’ve proven invaluable for getting hairstyles right. This braided bun is something I’ve wanted to draw for a while, but since asking random passer-bys to stand still for art practice isn’t really reasonable, my hairstyle magazines saved the day. What sorts of hairstyles would you like to see for Marisole in the future? I don’t have very many Asian paper dolls, partly because it took a long time before I was comfortable drawing epicanthic folds, which are a characteristic of many East and Central Asian people, though are by no means exclusive to those groups. There is a huge variety the shape of the epicanthic fold and I never felt like it looked right until I got to grad school and ended up sitting across from a Chinese student for an entire semester. I don’t know what she did to stay awake, but what I did was use her as a model for my first Asian Pixie paper doll, named Zoe. Of course, she didn’t have blue hair or such a huge head, but I digress. So, the Poll is over, since January is done and a child paper doll won to my own astonishment. So, I’ll get on that. In the mean time, enjoy Madison.